(Newser) – Scientists are sometimes tasked with saving animals from extinction. But in Florida, extinction, at least locally, is the goal. 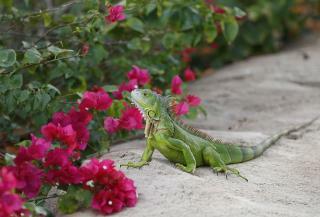 As part of a three-month project aimed at culling high numbers of invasive iguanas in the Sunshine State, researchers at the University of Florida are killing the animals with blunt force trauma—smashing the reptiles' heads against hard objects, from rocks to vehicles—or a device that sends a metal bolt into the brain, reports the South Florida Sun-Sentinel. Research coordinator Jenny Ketterlin says both processes are more humane than decapitation without anesthesia, but others have doubts. One veterinarian says the animals should be sedated and euthanized while a resident who claims to have killed 100 iguanas with a pellet gun argues his method is less tortuous. Of course the Vet. wants a complicated procedure. He/she sees dollar signs. In today's global, we now have species that shouldn't be, in so many spots and they have become pests. Should we take the pythons in Florida and sweetly send them to their death? Kill them however.